Create shiny rack cards with all the information your customers are looking for. 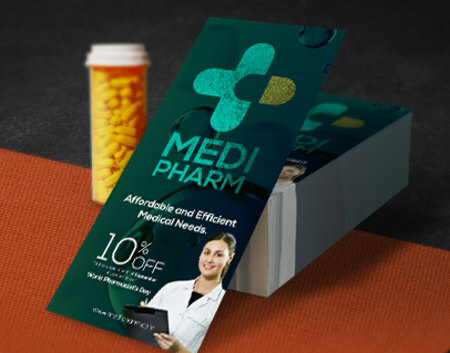 Entice customers with metallic rack cards that stand out at first glance. Add metallic accents to your hotel logo or call attention to a list of premium massage services. We print metallic rack cards in the standard 9” x 4” dimension and on durable 16 pt cardstock. Its thick weight adds to the luxurious impression of your business. Choose among three finishes on the front or back sides of your metallic rack card. Use our metallic rack card layout templates to ensure that you lay your artwork out correctly. The layout templates can be downloaded as EPS, PDF, or JPG files. Follow the specifications provided below to set up your files. Display them in key areas. Where do your customers frequent? If you’re a hotel or tour service, you’ll want to display rack cards at the airport or a tourist information center. Do it better than your competitor. Study your competition’s marketing collateral. Strategize how you can communicate with your audience better. Observe their strengths and weaknesses in copy, image choices, offers, etc. Highlight only the most essential information. Rack cards don’t have enough space for lengthy text and paragraphs. Keep the customer’s focus on a list of product or service benefits. The information they need should be easy to find.